Ubiquitous, Ambient Communication in the Home. Eldercare is fast becoming a key challenge for our society, with the shortage of trained personal and the rising number of elderly people. New and innovative approaches are needed to help elders remain at home longer and safer, to age in place. 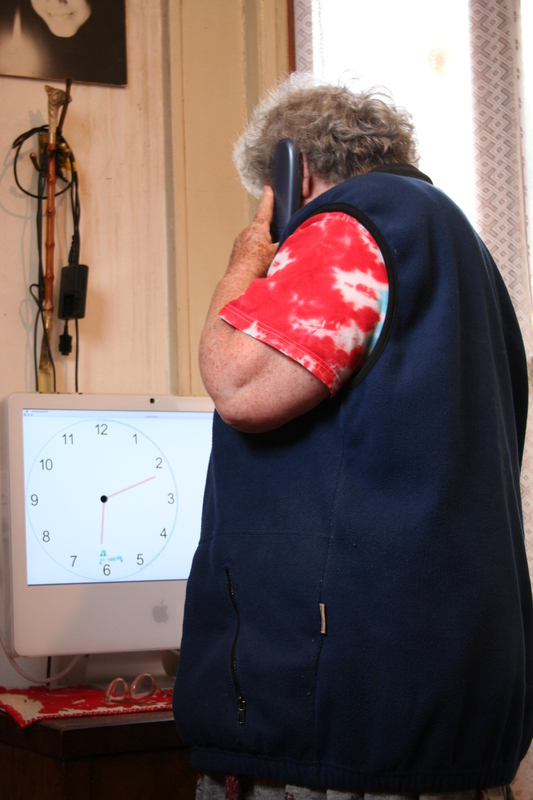 Monitoring approaches have gained a large popularity in human computer interaction, but remain systems supporting caregivers’ task, helping the helper, rather than directly supporting the elders. To seek alternative to monitoring solution for supporting aging in place, I conducted a user study with 14 elderly participants living independently to understand the role of communication plays in maintaining their independence and well-being (See user study chapter in my thesis). Results of this study highlighted the importance of peer support groups, built upon the concept of PeerCare, the communication of routines, and the awareness of rhythms to ensure that elders’ do not become isolated, thus remaining more independent and safer at home. Based on these findings, I designed a communication appliance, called markerClock, targeted towards the elderly. A clock is a ubiquitous device in home environments, which provides an explicit, well known mapping between angular position and time. Rather than introducing a piece of equipment with which elders would not feel any familiarity, I chose to augment a familiar object, which already has a function and belongs in elders’ home. markerClock is an augmented clock designed to support home routines awareness, and to allow users to establish and maintain lightweight communication routines using a poor medium. Routines awareness is achieved using trace of the measured motion occurring in front of the markerClock, while lightweight communication is achieved using symbolic codes which users can drop on this trace. 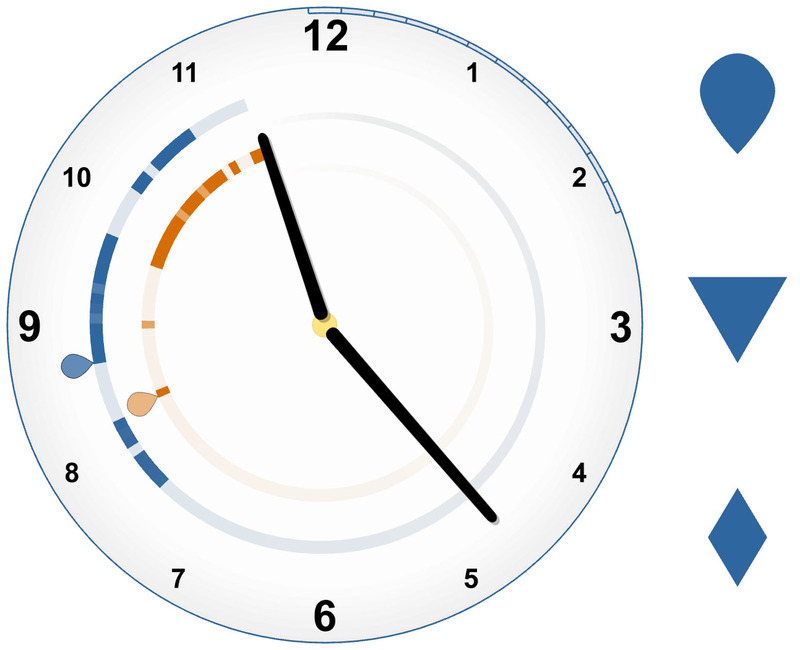 MarkerClock makes use of the existing familiarity of the time/space mapping by placing communication information around the clock at the angular position corresponding to the time of the represented information. 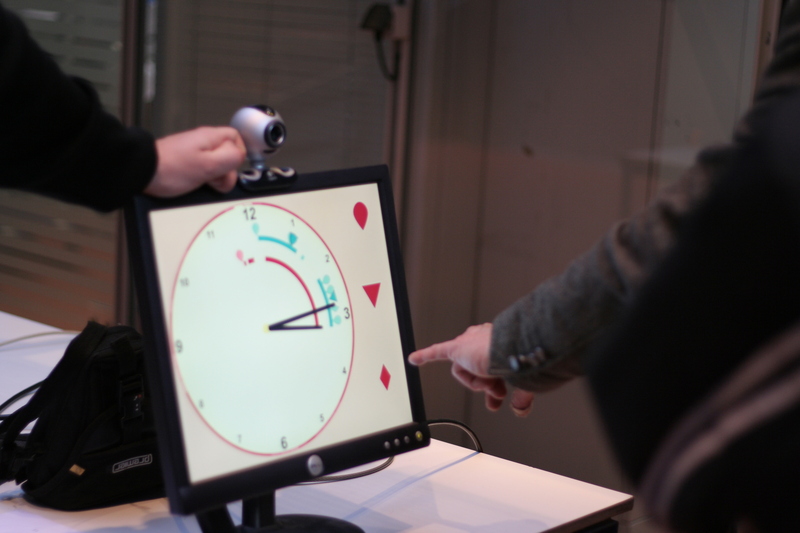 Motion is measured by a motion detection algorithm analyzing the feed from a webcam. 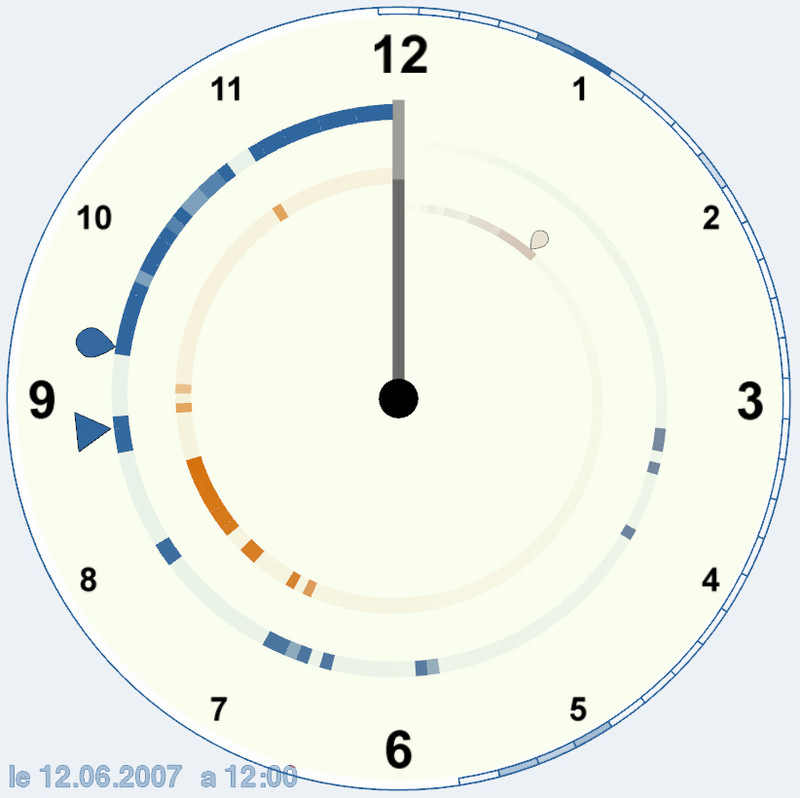 The measured motion value is then added to a history, represented on the clock as a spiral trace showing the last 12 hours of information for each user. 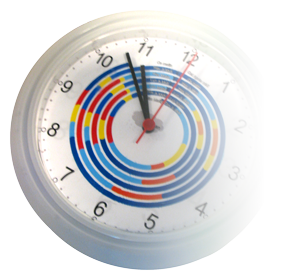 The traces for each markerClock appear in concentric rings, and time of the trace information can easily be read against its position on the clock. For instance, a motion occurring around 11.23AM, as the user walks in front of the markerClock probe, will appear at the same angular position as the one the hour hand would occupy at this time (See images on the left, click to enlarge). Symbolic codes allow users to communicate actively with each other. Three symbols are provided: drop, lozenge and triangle. These symbols have no predefined meanings, but rather allow users to create codes for their own convenience, using only one or a combination of symbols. This lack of prior meaning is intended to allow me to observe the types of messages users want or need to exchange using markerClock. We expect them to dynamically create new meanings for given codes. With markerClock, the information captured is not provided to users in a directly interpretable way. Rather, the information is presented in an ambiguous way, leaving its interpretation to users. Here, I only chose to capture one type of activity indicator, motion in front of the device, in an attempt to reduce privacy issues by limiting the amount of information gathered, and to simplify the design. This means that the information captured could be directly traced on the clock and does not require an aggregation or pre-interpretation of the data to summarize it. Rather, I provided a detailed summary of the captured data directly to the participants for them to reflect and interpret it, if desirable or necessary. By introducing these ambiguities, I sought both to observe how users would interpret the data, and also force users to make choices and take decisions. To better understand how the role of routines and rhythms information in elders' communication, I conducted two month-long deployments of markerClock with elders. The chapter called Supporting Life Rhythm Awareness of my thesis gives more information regarding the deployment of markerClock. Yann Riche and Wendy Mackay, in the Journal of Computer Supported Collaborative Work, 19(1), Springer Verlag Feb 2010.